Now this is what a football coach should look like. Sam Isaac, front and center, with a leather sport coat, dark glasses and a full beard. Obviously, he was not into wearing athletic gear. A pair of those embarrassing polyester Bike coaching shorts? No way, man. Sam's clothing was suitable for the bar or the sideline. I think he intimidated the opposing team more than the players did at St. Mary's, where he coached for many years. This is a yellowed photo from the Catholic Weekly in the Fall of 1980. 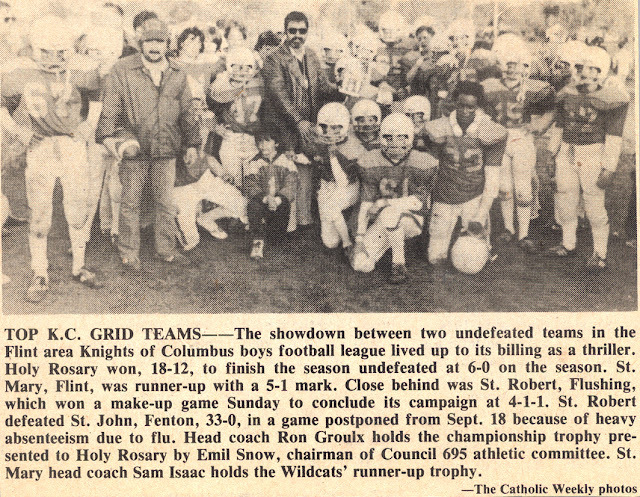 St. Mary's has just lost the championship game to Holy Rosary in the Knights of Columbus football league. The year before, St. Mary's went 6-0. The year before that, we lost every game. As you can imagine, Sam was more fun to be around when we were winning, but he was a great coach who would have done anything for his players. And you haven't really lived until you've heard one of Sam's pre-game talks. Or was it more of a pre-game yell? The ritual at St. Mary's was to troop over to the convent in full gear, navigate the narrow basement stairs, and circle Sam while he delivered a "colorful" pep talk, lit only by a bare lightbulb that hung from the ceiling. Swearing and wall punching were included, free of charge. Then we'd head out to the grotto near the church, get blessed by Father Berkemeier, and get on the bus. The game itself seemed pretty mild-mannered after you'd been through all that. Sam Isaac is one of the people that made growing up in Flint so great. UPDATE: Bill Suttles, captain of the undefeated 1979 St. Mary's team, has reminded me that we not only got blessed in the grotto, we actually helped build and maintain it. The nuns were happy to put the students to work gardening, moving large items and cleaning the church. It was all part of a well-rounded education. Is that Flint Northern '68 grad Sam Isaac? Sure does look like him. If so, we were in the same class at NHS. "The Future Lives in Flint! I personally know Sam Isaac as one wonderful man! So glad to come across this great story. I was also in the Flint NHS 1968 graduate class along with Sam Isaac & Randy Gearhart. Sure miss you guys! Hope you all have outlived that Flint water crisis.